Photo: Monde Kingsley Nfor/IRIN. Cameroon military on the lookout for Boko Haram militants in the Far North's Kolofata community, along the border with Nigeria. FAR NORTH, CAMEROON, 5 March 2015 (IRIN) - Hundreds, perhaps thousands, of young people in northern Cameroon, who lack access to school and employment, are increasingly fighting alongside Boko Haram, local authorities say. Underemployment, among all age groups, is at least 75 percent. Many young people, especially recent graduates, say it is impossible to find decent work. Poverty rates in the Far North, which is already known for its high levels of food insecurity and malnutrition, have been on the rise since 2012, when Boko Haram attacks in the region began to impact the local economy. Increasing violence in the region has also closed more than 170 schools along Cameroon’s border with Nigeria. In areas where schools remain open, many students are too afraid to attend. Boko Haram recruitment tactics in the border communities have changed to take advantage of this growing poverty and lack of opportunities, the government says. Members of the Islamist militant group used to radicalize new members through preaching in mosques and around villages. Now, they are increasingly using economic incentives to persuade unemployed youth and former students to join their ranks. “In some border communities, Boko Haram groups are considered a religious and not a terrorist group, thanks to the brainwashing that they have done on both the young and old alike,” Nouma said. Many of the young men that IRIN spoke to say they have been faced with the choice of joining Boko Haram and securing their financial future, or sitting at home with nothing to do as their families struggle to afford enough food to eat. Moustapha Alidu, who used to live in a border village outside of Kolofata. Alidu, who fled his home after declining Boko Haram’s offer, said he believes that those who do join the group are “ignorant,” but that the offer made is tempting. (US$600 – US$800) each month to join their cause. The minimum wage, for those lucky enough to be employed, is just 36,000 CFA (US$72) per month. Many other young people believe that joining Boko Haram is the only way to keep their families and villages safe. Abdulai Dhaba, a father of eight, from Makari, says he no longer knows the whereabouts of three of his sons. He fears “radical Muslims” might have fooled them after an attack on his community last month. “They [Boko Haram] took away our cows and sheep,” he told IRIN. “What they could not take they simply set on fire. After, my boys had no school to go to, no animals to care for. In such conditions, who would want to stay in the village?” he asked. The government’s response has been to increase security in the region and invest in the economy. 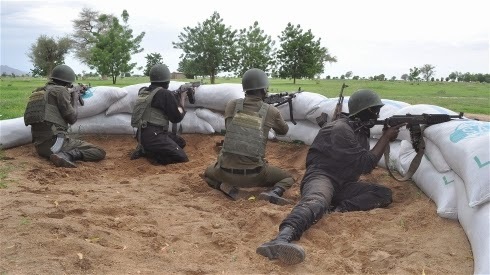 More than 6,000 troops have been deployed to the Far North to protect communities from further Boko Haram attacks. Despite just 50 percent of the investment projects in the region being completed last year, due to ongoing violence, the authorities say initiatives are now underway to safeguard its poverty-alleviation strategy, despite Boko Haram threats. The government has also created a 78.8 billion CFA (US$133 million) emergency fund for the region this year, which will finance 94 different projects, ranging from road construction, to railways, energy and agriculture. President Paul Biya has urged partners to prioritize the youth when employing workers on these projects. All these initiatives are aimed at decreasing local unemployment and generating money in border communities, reversing the conditions that Boko Haram has exploited.